I was so surprised to find out that the Gin Blossoms released a new album (they disbanded in ’97), and I listened to the snippets on iTunes, and now I have to get this album! It sounds great, just like always. I watched some of the Emmys, even some of the Emmy pre-show crap. I just loved how Jeremy Piven was putting Billy Bush in his place for asking him dumbass questions. I love Piven, I was happy he won. He’s very talented. And on that note, I’ll close with a quote from PCU. Droz: I don’t know if you’re aware of this, Gutter, but there actually was music recorded before 1989. I got tagged by Sharon, and she’s so sweet, I had to do this for her. Here are 5 people I’m tagging: Geoff, Kelly, Lisa, Athena, Chris (either of my Chris friends) If you don’t post it on your blog, at least email me your answers. Okay, in case you didn’t get details from Geoff’s post, here is my post about Vegas. We got in Tuesday night, and had dinner at the buffet. Then Elijah and I went to bed (’cause I was tired), and Geoff went to gamble and wait for his parents to arrive. They got in a little late, but the three of them enjoyed a beer when they got in. Geoff had lost some money at blackjack, and was a little disappointed. The next morning, we met up for breakfast and mapped out our morning. We went to the strip, and walked around the Forum shops at Caesars. We went next door to the Mirage, and Treasure Island. We headed to the Venetian for lunch. We walked back to the shuttle and spent some time at the pool. I went to the salon to get my hair cut before my big date with Geoff. We had reservations at five for Delmonico in the Venetian. We caught a cab, and sat in the lounge until our table was ready. This is hands down the swankiest restaurant I’ve ever been in. The atmosphere was lovely, the food was unbelievable, and it was a wonderful night out. We returned to our hotel to say good night to Elijah before we went to play some blackjack. I have a plan you see. I have a number in my head of how much money I’m willing to lose, and I walk away when I get to that number. Then I can still have money in my pocket. I left when Geoff went out, and I was at $53 left of my $100. Thursday we went back to the strip, heading right for Paris to get some coffee. We think we might want to stay there for a future visit, it has such a great atmosphere. We enjoy our coffee, resist the pastries and then walk around the Desert Passage shops at Aladdin. 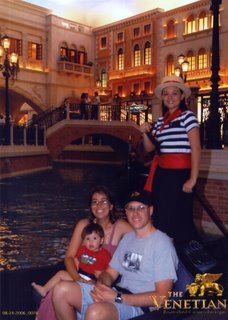 We go back to the Venetian to do the gondola ride. The outdoor version is cancelled due to the wind, so we go to the indoor ride. We’re lucky enough that each family got to enjoy a private gondola. Our gondolier is Angeline, and she has a fabulous singing voice, she sings That’s Amore and a lullaby for Elijah. It was a wonderful experience I suggest everyone take advantage of. We caught a cab back to the hotel to get some lunch. We settled on Sazio, an Italian restaurant. We had the whole place to ourselves. The food was tasty, even if we had to wait a little for it. After lunch, Geoff wanted to teach me how to play video poker. We hung out for a while, Glen & Diane got ready for their date night, then we all hopped in a cab to the Bellagio. We walked around the conservatory which was all decked out with trains and carvings of famous landmarks and buildings. It was Elijah’s favorite thing to see I think. We went outside to catch the 4:30 showing of the fountains, but the wind had them canceling it. So we went to the Mirage to say goodbye to Glen & Diane (they had tickets to see LOVE), and caught a cab back to our hotel. Elijah & I went to try and relax in the room, Geoff went and played craps (and won over $100). We met up for dinner at Terrible Mike’s (which isn’t terrible) and then Geoff & Elijah went to relax in the room and I went to play VP and Blackjack. I got back to the room a while later, and we ordered champagne to surprise Glen & Diane as an anniversary gift. They got in, we heard how fabulous the show was and how they had a wonderful time, and then the champagne arrived. Obviously I didn’t have any, but Geoff and his parents did. Friday morning we hit the buffet for breakfast, which I wish we had done sooner. I really miss that now, all that selection. We shopped at gift shop and I played some VP with Geoff, while Elijah enjoyed Nana & Grampy time. It was then I hit 4 Aces and won $200 (on top of the $73 was still left in the machine). I cashed out immediately. After we checked out, we hung out by the pool in the shade until it was time to go to the airport. Since we shared a cab and had to go to two different terminals, it was a quick goodbye. I did an audio blog post yesterday morning, but it did not turn up. Sorry. I’m not quite ready yet to write down everything, I’m still kinda tired, so here’s a short list. I’ll fill in the details later. I didn’t take many pictures, because it was my 3rd time there. But here’s one picture for you. All the anxiety I had about the trip to Vegas is gone, now I’m excited. I love the idea that if I wake up hungry at 1am, I can go downstairs and get some food. I can’t wait to see the fountain show at the Bellagio again. It’s one of the most wonderful things I’ve ever seen. This trip will also hold some new activities, like the gondola ride at the Venetian. Geoff and I will also get to have a date night. And Elijah will get a lot of Nana & Grampy time. We’re not bringing the laptop, so I won’t be able to upload pics until Friday night/Saturday morning. But I will have my cell, so I’ll be able to audio blog. Honey will be in good hands with Amy, I’m gonna to pack either tonight or tomorrow morning. Everything is set. Are we there yet? I’m closing with a quote from The Simpsons. Marge: If I had known that there were loose women in Las Vegas, I would’ve never let you go. You’re gonna have a great time when you go to Vegas soon. I’ll see you in March. I love Angry Alien Productions. Not much going on here. Sunday I finally got to hear the new worship leader at church. He’s awesome! After having the music be so all over the place, it’s nice to have a permanent guy in the job (and who is super talented). The weather has cooled off, I know I’ll be missing it next week when we’re sweating in Vegas. Speaking of Vegas, I’ve been practicing my Blackjack. Just trying to remember basic strategy. The last week I’ve had to deal with some stress, but now it’s someone else’s problem, which makes me happy. It’s just unbelievably frustrating when you have to check up that people are doing what you ask of them, and they aren’t. But like I said, it’s someone else’s problem now, so I can let go of that stress. I saw the video for Franz Ferdinand’s Do You Want To, and I’ve got to get that song! It is so darn catchy. The video, on the other hand, could have been an episode of Kids In The Hall. Just my opinion. My travel bug has been satiated, with my upcoming trips, and the visitors coming this fall. But I should stop watching the Travel channel, because Samantha Brown but the desire in my heart to go to Germany. It’ll have to wait until the kids are older, to where they can go with us, or go to stay with family. In honor of Bruno Kirby’s death, I’ll close with a quote from City Slickers. Mitch Robbins: It’s nothing to be ashamed of – I had the same problem. Phil Berquist: Didn’t you feel stupid; I mean, didn’t you feel… inadequate? Mitch Robbins: Yeah, for a while, but then I overcame it. Can I explain it to you again? I mean now promise me you won’t get upset. Phil Berquist: O.K. ; it’s not gonna to do any good. Mitch Robbins: O.K., if you want to watch one show but record another show at the same time, the television set does not have to be on channel 3. Phil Berquist: Yeah it does. Mitch Robbins: No it doesn’t. Mitch Robbins: No, if you’re watching what you’re recording, then it has to be on 3. Phil Berquist: What… the TV or… or the machine? Phil Berquist: You’re saying I can record something I’m not even watching? Mitch Robbins: Yes, that’s the point. You don’t even need a TV to record. Phil Berquist: How would I see it? Mitch Robbins: Well to see it you need a TV. Ed Furillo: Shut up! Just shut up! He doesn’t get it! He’ll never get it! It’s been 4 hours! The cows can tape something by now! Forget about it please! Phil Berquist: How do you do the clock? Ed Furillo: You’re dead. You are dead.